The subject is likely based on the theatrical figure of Bobby Lobby, played by Mr. Munden in the pantomime Blue Beard or the Flight of Harlequin, first performed at the Theatre Royal, Covent Garden, London on 21st December, 1791. The chorus of Bobby Lobby's solo song appears on the lower part of the image which is based on a print published 28th March 1792, by Robert Sayer & Co. The reverse has a black print of a rural scene within a neoclassical border. Mezzotint and etching inscribed, My name's Tippy Bob &c... Publish'd 28th March 1792 by Rob.t Sayer & Co. Fleet Street, London. Reverse side depicting rural scene. 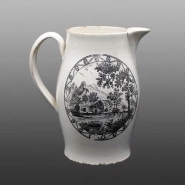 Creamware jug with black printed decoration.One side entitled Tippy Bob depicts 'dandies' in a coffee house. The print is signed beneath the scene on the left with Aynsley and on the right Lane End. The subject is likely based on the theatrical figure of Bobby Lobby, played by Mr. Munden in the pantomime Blue Beard or the Flight of Harlequin, first performed at the Theatre Royal, Covent Garden, London on 21st December, 1791. The chorus of Bobby Lobby's solo song appears on the lower part of the image which is based on a print published 28th March 1792, by Robert Sayer & Co.